Of all the traditions Tech has few involve that faculty simply catering to students, but that is exactly what Student Center Programs Council’s (SCPC) Midnight Breakfast has to offer. The origins of Midnight Breakfast began over 10 years ago. From the beginning, Midnight Breakfast has been a way to break down typical barriers between faculty and students. Even more, however, it is a pleasant reprieve from the typical rush and panic of Final’s Week. “Its a time for students to relive stress, get a free meal and just remember how to get through the week,” said Sourjya Rudra, third-year BA major and SCPC President. This year, Midnight Breakfast will take place on April 29 from 10-12 AM in the Student Center Food Court. This year will also include “Relaxation Fest,” which is an event where students can get massages and even participate in a yoga class. “Relaxation Fest is a really cool addition to Midnight Breakfast. Students can eat their meal and relax at the same time,” said Rudra. 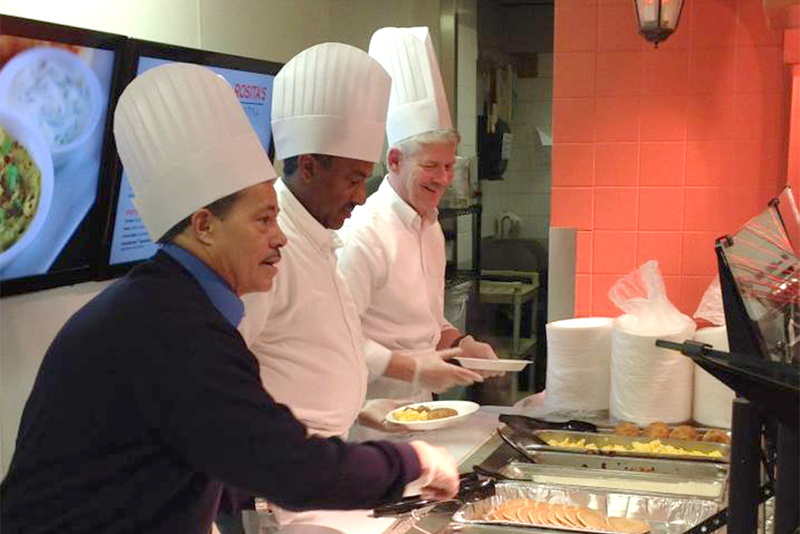 President George “Bud” Peterson and his wife, along with Rich Steele, Director of Auxiliary Services, and countless other faculty members typically serve students typical breakfast diner fare, including orange juice, pancakes, eggs and bacon. According to Rudra, over the years the menu has changed more than anything else. Because of their budget, they cannot always get all the different cuisines they would like. However, student input is important when deciding their menu. Members of SCPC begin preparing for Midnight Breakfast about a month. They submit the menu to GT Dining, begin work on the events publicity and finally faculty and staff are asked to volunteer. “Its such a traditional event that most of the legwork has already been done. Right now, its just keeping the tradition going,” said Rudra. Rudra has his own favorite part of Midnight Breakfast is getting to serve breakfast alongside President Peterson. “I have to say serving the food is my favorite part. You get a really funny chef’s hat and apron and get to serve your friends food along with President Peterson. Its a really weird experience but its so cool that I get to do that,” said Rudra. Rudra expects the Midnight Breakfast to continue to grow but not change too drastically. The once new SCPC event is now a weathered Tech tradition, something Rudra is proud to be a part of. According to Rudra, there is no difficult aspect of putting the Midnight Breakfast together. “There just really isn’t a difficult part. Its just really, really fun. There is nothing wrong with it and nothing we need to fix…Even the faculty and staff are extremely responsive to the event,” he said. Rudra is also happy with the effect the event has on the student body. “It really does serve its purpose. It’s a break in the middle of a stressful week and it’s successful because of that,” said Rudra.